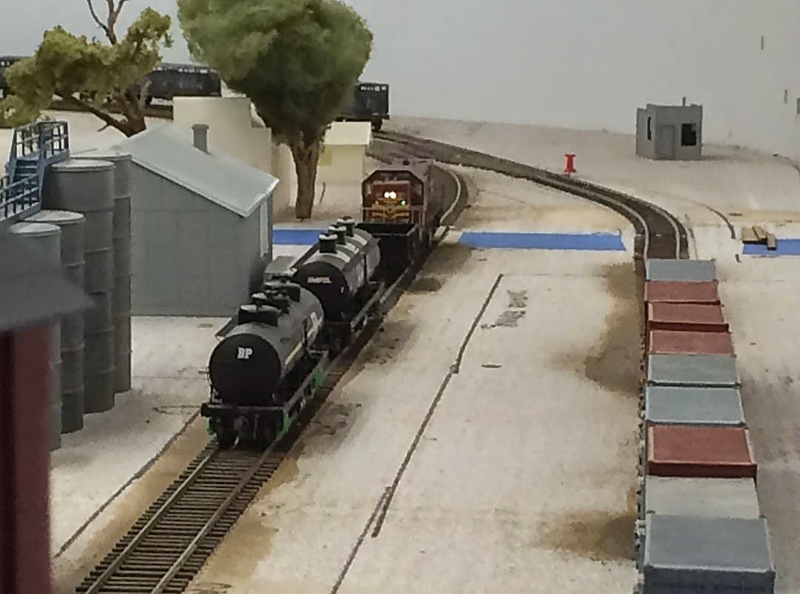 A 49 class working the Buggardine Goods slowly approaches a pair of fuel wagons on the Ampol/BP fuel siding. And, yes, if you look closely, you'll find there is an S-truck serving as a buffer car, per shunting requirements. This view is seen from an elevated position in the flour mill; the containers on the right are occupying the new cotton cooperative loading yard. I've always thought there were three types of model railways: one that were designed to look great, with a lot of thought given in planning as to the visual aspect; those that were operationally interesting; and those that combined both elements. 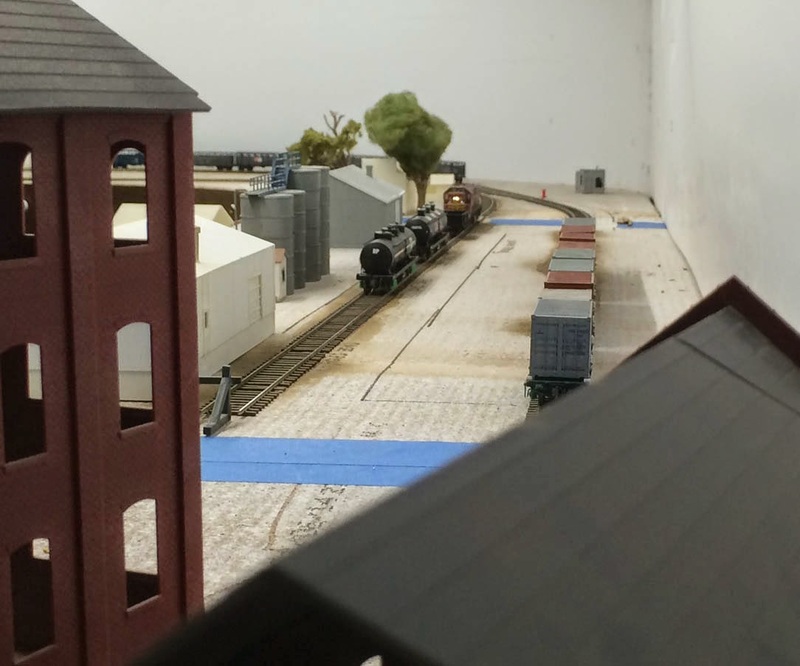 One model railway that definitely offers both experiences of great operation and fantastic visuals, among several out there, is Ray Pilgrim's Bylong layout. The layout is incredibly engaging to operate, but to me what really sets it apart is Ray's eye for design: engaging the viewer and pulling them into scenes (which are expertly executed). 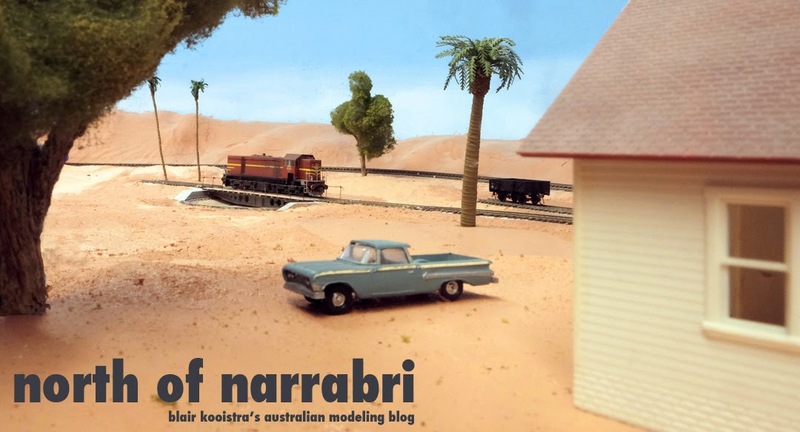 Recently, Ray's blog featured a tasty selection of scenes on his layout. A few of these in the selection entitled "Bringing it Together" are wide views of swaths of the layout to put its design in context, but the majority of photographs were made not as if we were hovering 10 stories above the ground in a hot air balloon, but from ground level, as a gunzel would. The design of the layout is highly influenced by scenes inspired by railfan photography. I'm going forward with Buggardine with the same emphasis as Ray, thought on a simpler, smaller scale: I want the operation to be smooth (don't want the process of the mechanical issues such as dirty track, rough joints and such to interfere with the operational inexperience) and as realistic as I can make it given my knowledge of the subject. But just as important, I'm designing the railway with several scenes that I hope operators will crouch down and put their eye at near track-level to enjoy while they're operating. Here's a few scenes--in their early stages, again as I always say, mocked up to engage my own imagination and motivation to keep moving along. These photos are on the terminus end of the railway, along the Oil Siding and parallel Mill siding. A tighter crop of the above scene, taken on the iPhone, which makes up for in convenience for a lazy modeler what it loses in picture quality (don't worry--when the scene is complete it'll deserve a retake with the "professional" camera). In distance is the livestock siding. 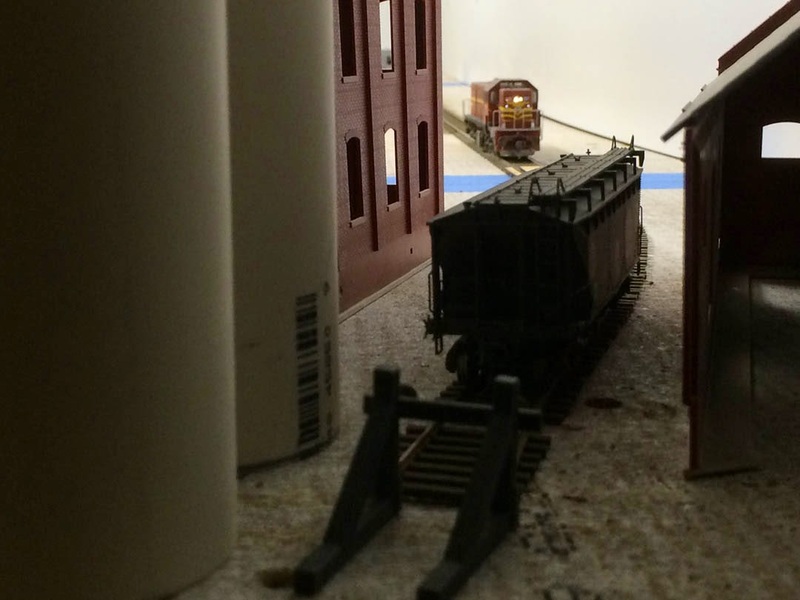 Now shunting the flour mill, the 49 Classes approaches the confines where an empty wheat wagon is ready to be pulled. Six Weeks On. . . Since returning from the east, I've been a busy mofo' with the railway. I've been highly motivated to get the layout up and running, and not let construction and my interest drag down buy doing "too much thinking." It's been about six weeks since I started reconstruction with the open grid portion of the railway coming down the hill into Buggardine. Having reusable layout tops for the station district and terminus portions (just needed to have the old sub-roadbed replaced) and not having to change the overhead lighting valance much really kept things moving along. I was able to salvage all the points I needed and about 75% of the track I needed (that new track was the Micro Engineering c70 flex I used coming down the hill). This weekend, I finished the track work (still have a little to go in the loco depot, as well as fine-tune some points, file down a few rough rail joints, etc. ), installed the last piece of .060" styrene backdrop (though it still needs bondo on the seams, primer and a first coat of sky), added Blue Point point mechanisms and rod-in-tube throw rods, put up the layout fascia,finished the wiring, and hooked up the DCC. We have a (new) railroad! It was exciting to watch a 47 class come through the wall out of staging with a full load of FWH and RU wagons and into Buggardine, then shunt the wagons and pull the releases and return to staging. Magical! A week or two and I'll have a few of my mates over for feedback (ok--to show it off!) and to run a few trains. Why an S truck on the RTC's for shunting purposses? A cover truck was only required for steam locomotives when the RTC's were loaded, & not needed when empty. As you are modelling diesel era its a requirement that is not needed. Lack of detail in the pictures? Nah, looks great to me! And the concept you have embraced is one that I decided five years ago to aim for in retirement. Small, detailed, smooth and fun! Great start Blair, & like you say Ray's layout is very inspirational. We (almost) have a new railway!